WARNING: This story starts in my bedroom when I was in my mid-teens. On my bedside table was a white Bush radio alarm clock. As well as setting an alarm you could use a function called "sleep" to set the radio to play for either 59 minutes or 1 hour 59 minutes (why not one or two hours? I used to think, but this is not important to the story). On a Sunday evening I would set this function to the maximum time and drift off to sleep listening to (nearly) two hours of John Peel playing wierd and wonderful music from all over the world. It is where I first heard bands that came to define and shape my musical taste, attitude and sometimes my hairstyle (and looking back at some of those haircuts, not always in a good way!). Via Peel I was introduced to Nirvana, Half Man Half Biscuit and my favourite band in the world to this day, the incomparable Teenage Fanclub. I'd adjust the volume so I didn't disturb my sister across the landing then hit the lightswitch at around 11pm plunge the room into darkness leaving just the glowing red of the clock's LED display, the music and the understated enthusiasm of the greatest DJ ever. I loved this show, it made Sunday night cool, it didn't matter that it was the pre-cursor to a Monday morning return to school. Great music, great banter. When I graduated from Uni in 2001 John Peel was the celebrity guest on hand to dish out the certificates at the ceremony and I got so look him in the eye and shake his hand. That was cool. 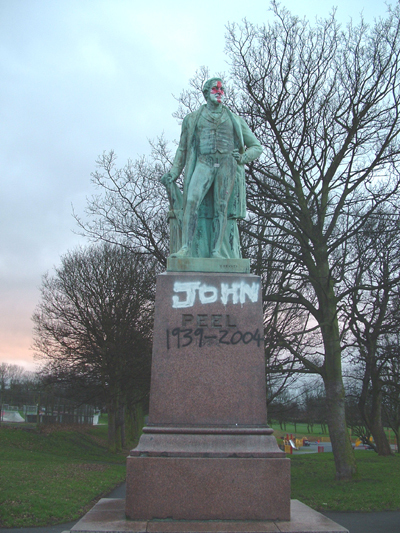 I remember the shock and sadness I felt when I found out he had died. I had listened to him so much over so many years that it was just weird that he wasn't on the radio anymore. For me John Peel will forever be associated with good things and good times. I see or hear anything to do with him and it reminds me of those alarm clock days and nights and a good feeling follows. Fast forward to 2013. It is a Sunday evening, I am off on Monday and I plan on spending all of the day out on the Patch looking for Wheatears and any other migrants that have dropped in. I set the alarm for crazy o'clock and drift off to sleep thinking about what kind of day I'm going to have. As I get the kit together on Monday morning I wonder what I'm going to see. Will it be a good day? Where to go for the best? I've only got today, time is precious and I want to make the most of it. I suppose I'm kind of worried that I'll go to the wrong place at the wrong time and miss out on some good pictures. I decide to head to Leasowe Lighthouse so head out for the early train still munching on some toast. Ticket purchased I walked down platform to board the train. As I do this I got a sign that I'd made a wise choice and it's going to be a good day. The local train operator has named the odd carriage after famous(ish) locals. I've not seen many, there is not always one on each train so I took finding the John Peel coach as a good omen for the day. My mobile phones rings and it's my dad. He is free today and fancies a day out on the camera. He is heading this way and we arrange to meet on the path by the sea wall. I work my way around the paddocks and drift towards our rendezvous. 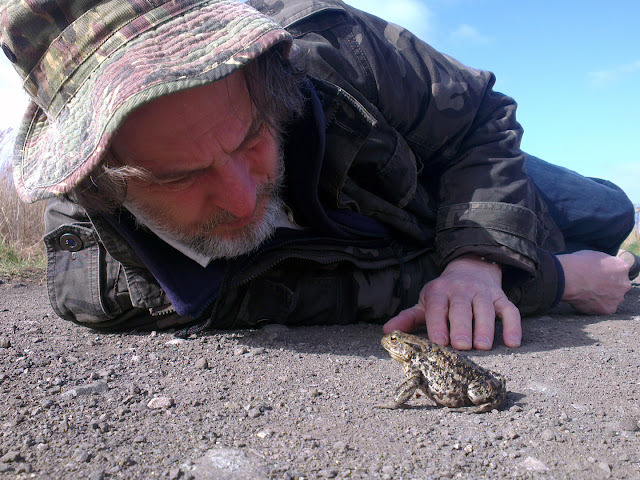 Soon I come across the old man.... deep in conversation with a toad. This comes as no surprise, @ronthomasphotog (to give him his Twitter title) is known to attempt to converse with whatever wildlife he has been photographing. The conversation seemed to be going well and the resulting pictures secured him a BBC Springwatch "Photo of the Day" award. After the toad had hopped off we continue along the path seeing plenty of Swallows and my first House Martin of the year. 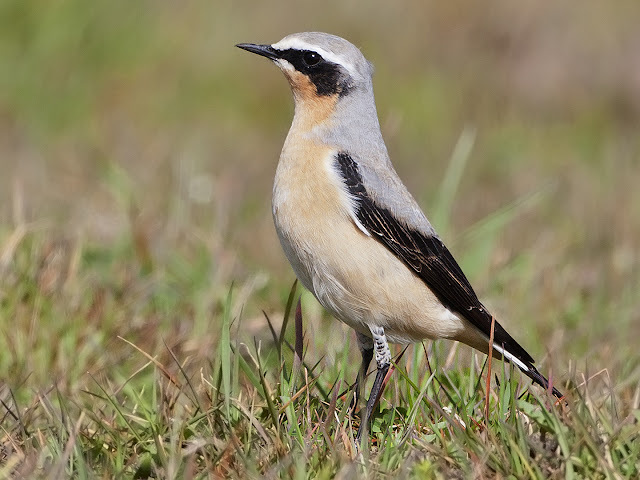 We decide to go back around the paddocks to see if the Wheatears are being a little more obliging. The sun is out, the wind is light and the birds are singing. This is turning into a rather fabulous day. We drift around talking about nothing in particular just enjoying not beeing cold and wet for a change. The path we are on is narrow and there is tall grass between us and the field we are looking across. 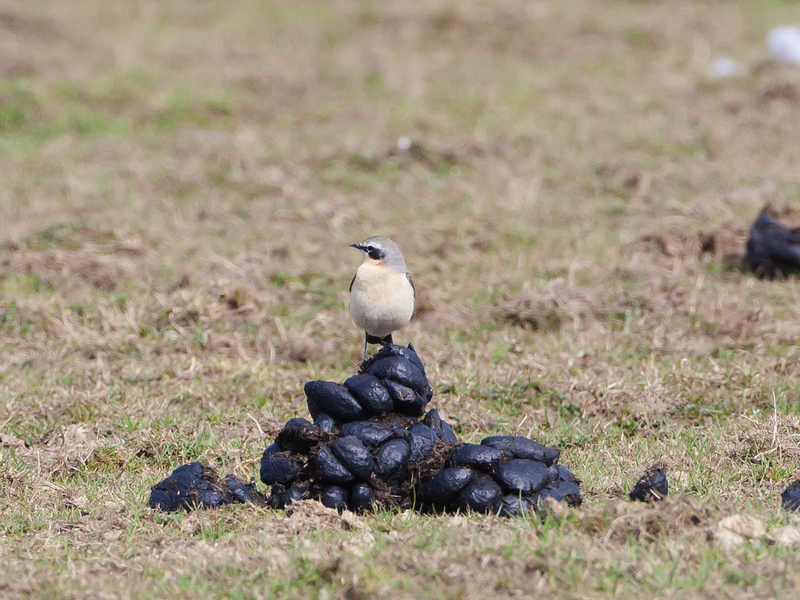 A stunning male Wheatear is hopping towards us from the far side of the horse pooh strewn muddy paddock. 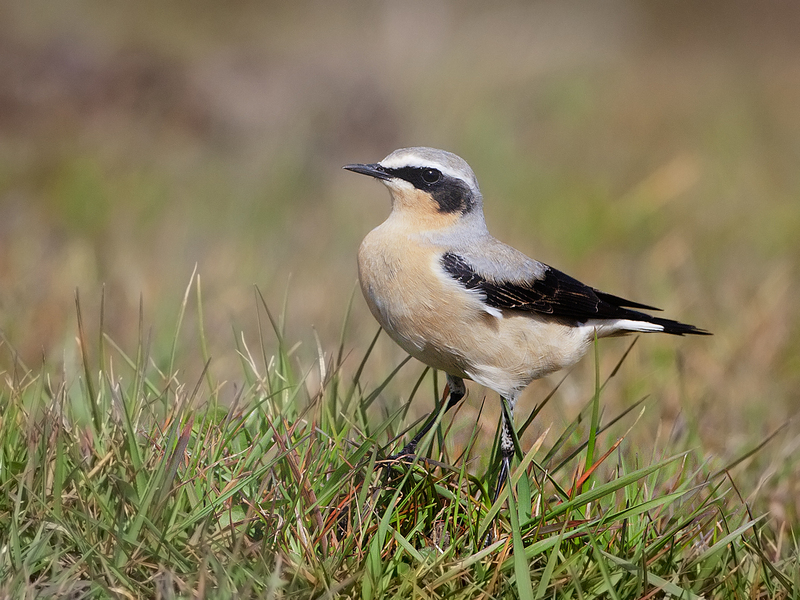 I think that Wheatears are my favourite bird to photograph. I wait for it to come closer. It is feeding much like the plovers that you can find on the shore. It stands still, looks for a grub then dashes after it. I lie on the path and poke the lens through the grass and take its picture. The colours are subtle and delicate, lovely soft peach on the front and a gentle blue-grey coloured head and shoulders. It is also the limited time that they are here that makes them my preferred subject to photograph. Soon this and the other birds will move on and I won't see them again until autumn migration, and then only for the short time it takes for them to pass by on the way to Africa. I fill a memory card trying to get a decent portrait. 300 pictures are taken. I could spend all day taking pictures of Wheatears. Eventually I realise that I have! A day well spent. A glance at the watch reveals it is time to head to the station. 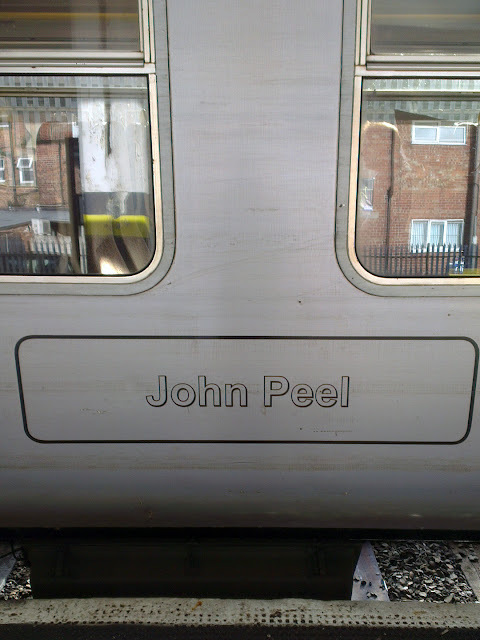 In the style of @ronthomasphotog I whisper a thank you and best wishes to my subject and catch the John Peel Express home.